First off I want to say that this is great conversation and I am really pleased that the team and other contributors are now able to discuss these matters in detail. Keep up the insightful thoughts and have no worry about flame wars; what we need now is open exploration of what the project is about and were it going. I just want to comment on the matter of versioning at the moment. Please do understand that I and Barbara fully understand the value of good versioning. (In fact is was the versioning capability that was most attractive about OSEE.) Without it traceability is at very best half baked. I also agree with you that it is so invasive into your model that tackling it as an after thought either leads to significant rework or a shabby job of it. In my opinion, though, if we tackle versioning in the initial release we will most likely never deliver anything. At the moment, to be honest, B. and I are the only ones who are actively contributing to the development. On that basis of resourcing it is already terribly scary when I think about the amount of work involved. To add another major feature daunts even my hutzba. I would also mention that when B. said "an implementation detail" what she was really saying is that it is a technical detail. This early in the model exploration I do not think it should be encumbered with these details because they make the model harder to understand from the users perspective. If I get convinced over the next couple of months that we can do versioning, then we can add it to model then but before the model is so concrete that it is difficult to do so. Btw, for the record, there is work in the EMF community that we may be able to use to get versioning for free or near so. I need a lot more research into these, however, before being brazen enough to count on it. here's my reply to your comment above point by point. Regarding versioning, I agree with what Joel has already replied above and do not really have anything to add. Concerning relationships, your idea of generic bidirectional relationships is a good one and I will add it to the model. As for Design Constraints, I still see them as ancillary to requirements, not requirements in their own right; however I need to explore them more deeply before expressing a final opinion. I agree totally in the benefit of including a Vision and/or Goals into the set of requirements we support. Again, a deeper exploration of both these artefacts is required on my part to see what, if anything, we require in the model in the way of support for them. Finally, about my definition of requirement: do you want my definition of requirement as the generic word we use all the time in conversation or the Requirement type in the model? After having taken some time to rething our discussion here I would like to raise the question whether we are taking the proper approach here, or not (thus the new discussion point). The current ORMF model is neither the only requirements model out there, nor are we the first ones to develop such a model. Popular requirements models are (but not limited to) the Robertsons Volere model (2006), the RUP model (Leffingwell, Widrig, Kruchten 2003), the Hatley/Hruschka/Pirbhai model (2000), or the requirements model by Karl Wiegers (2006). All of them share some commonalities and expose several differences, but none maps easily onto the current ORMF model. What are we going to do about this? Are we expecting everyone who wants to use ORMF to abandon "their" model for the ORMF one? What would be the advantage of using ORMF as opposed to some other tool? Aren't we striving for a framework - i.e. a set of building blocks from which concrete tools can be built? What would that mean to our ORMF model? 1. We leave it as it is and expect people to change their way of modeling requirements if they want to use ORMF. - in my opinion, ORMF would fail to meet one of its most important goals right from the start if we take this route. 2. We extend the current model and try to include the other concepts and models. - I think this would bloat the ORMF model and make it unmanageable sooner or later. - And where would we stop? After we have included 2, 3 or 10 other models? 3. We identify the commonalities between a (arbitrarily chosen) set of popular models and adapt the ORMF model to allow a more straighforward mapping to increase the potential audience for ORMF. We might as well introduce additional hooks and extension points to make the model more "open". - A potential approach, allowing to keep at least some part of the current model. - But we'll be missing the full potential of a true modeling framework. 4. We take a more generic approach, much in the sense of a modeling language to provide a framework (sic!) 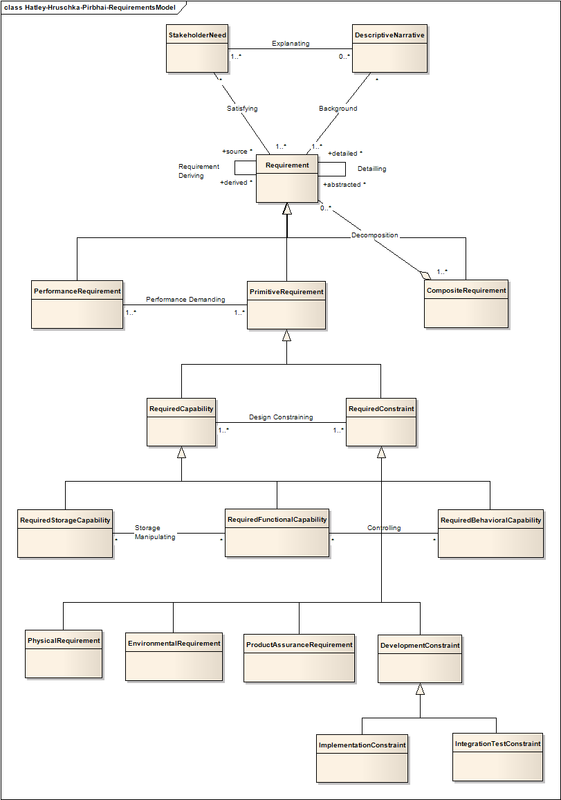 from which concrete requirements models can be derived (...parameterized, instantiated, etc. ), maybe in the sense of profiles. I could imagine to have the generic ORMF model and concrete instantiations for RUP, H/H/P, Volere and others. This would make ORMF a true requirements modeling framework - at the expense of a more generic approach (more difficult?) and the need to instatiate concrete models (one more step to be considered). - Although the most promising approach it will also be the most challenging one. I have not come to a final decision yet , although I must admit, I do have a favourite. Nevertheless, I am sure this needs more in-depth deliberation and (hopefully) opinions and thoughts of other people. Thanks for these thoughts, Wolfgang. I will attempt to explain what the existing ORMF model (and indeed the entirety of ORMF) is about and why we still feel, after reading your comments, it is appropriate. First of all, let me throw the cat in among the pigeons by completely differing from your opinion that "The current ORMF model is neither the only requirements model out there, nor are we the first ones to develop such a model". All the "models" you mention in your example are, in actual fact, not models at all, but methodologies or processes/best practices for requirements gathering and management. In actual fact, our approach has been very much guided and inspired by RUP, as well as the requirements specific works by Leffingwell, Wiegler, Armour, Constantine et al. All these resources express wonderful, rich ideas on what requirements should be about, but in the end of the day they all rely on free textual documents/templates for the definition of those requirements. The same is true for the Volere approach (they offer a template) and, I guess, for the Hatley/Hruschka/Pirbhai methodology (I am saying I guess because, after a brief research, I cannot find any information other than their -- somewhat outdated -- book, no other publicly available information). The novelty of ORMF/Useme lies precisely in the fact that we are, I believe, the first ones to propose to treat all requirements, including their textual descriptions, as structured elements, at least in the open world. Automated tools would not be possible without this structured nature. Please note that I am not talking about requirements management: there are many tools out there that help in managing requirements by assigning them standard attributes (priority, risk level, dependencies etc.). What I am referring to is the actual requirement description itself, which absolutely needs a structured approach for automation to be possible. In this light, the model we are proposing should not be viewed as the ultimate model for all requirements, a bit like the unified theory (aka theory of everything) in physics. It is to be considered as an artifice to enable the handling of requirements by automated tools and to provide auto generation of requirements documents that satisfy the needs of the methodologies you mention in your post. Another way to say this is that our model is not really a requirements model, but a meta-model or more precisely a DSL for the automated handling of requirements via any CASE tools that are built on top of ORMF. Of course the model still needs to be extensible for the benefit of third party adopters, and indeed we very much want to carefully engineer it to enable that in the most straightforward way. And of course, most importantly, all the methodologies you refer to (along with others that we have and are still exploring) need to be taken into consideration when deciding which elements and aspects of the various requirements models to include in ORMF for capture. This is, after all, what the survey of standards that we have launched is all about. Let me point out once again, though, that our model should not and will not be one of those standards; it will simply be able to support as many of them as possible in terms of the documentation that the ORMF based tools will be capable of producing. In our view, the various templates/documents proposed by the requirements gurus to which you point represent the end product, not the starting point, of ORMF. I hope this goes some way to clarifying where we stand and what this model is all about. This is a very fundamental issue, and it is really important that we are all on the same wavelength on it. thanks for your answer. I am happy to find we have a similar understanding of what ORMF is supposed to be ("...our model is not really a requirements model, but a meta-model or more precisely a DSL for the automated handling of requirements via any CASE tools that are built on top of ORMF..."). That reminds me of the core point I wanted to address, but obviously failed to do so properly. The requirements models I have mentioned are in fact models and not processes or else, there you are wrong (I can point you to the literature or the tools where they have been implemented), but that was not my point. All I wanted to highlight, was the fact that I considered the ORMF model already far too constraining and too concrete to be a true Metamodel. Since I am a visual person, I have quickly put together an idea of a model (really, take it as an idea only) of how I would like to understand ORMF. The idea is, to keep ORMF abstract enough to be able to construct different requirements models, but yet to offer sufficient support to make use of the framework worthwhile. I would therefore be much more generic than the current model. The two basic entities are Artefacts and Relationships, which are all Taggable types, that is, they support being described by tags, that is named values. Both can be part of Packages, although each instance can only be at most in one package at any time. Independent from packages are Collections, which are arbitrary groupings of artefacts and relationships based on some Discriminator. These collections form the basis for RequirementsDocuments, which also nicely covers the versioning issue (consider a versioning tag as discriminator). Since one requirements model is often epxressed in several different documents depending on the stakeholder to be addressed, allowing to group artefacts and relationships independently from packages seemed advantageous. Artefacts have at most one Owner, which could be some stakeholder, the actual author, or any other role that has a special interest in this artefact. RequirementsElucidator, RequirementsNarrative and Requirement are the lowest level of entities that I would consider part of the framework - if I were very progressive. Don't drop this idea immediately, think about it for a second. I understand, there is value in modeling the level below, buit we might have to expand out current list of concrete elements to accommodate a wider audience, which comes at the cost of more and more elements. As I said, the above is not a competing model, but my attempt to express my concerns with the current model and how I could imagine to find a way forward. Really great that you put your thoughts together into a diagram, it is a lot clearer and easier to discuss. I will need a bit of time to think your model through properly, although I already find it as covering interesting points. In the meatime, I would really appreciate it if you cold spend a few more words to describe what Profiles are and how they would play in the overall scenario. when I speak of a Profile I mean much of what constitutes a UML Profile (see the OMG list of UML profiles for a description: ). In short, a profile extends the core model mainly with stereotypes, semantics and, to a lesser extent, with additional elements based on the core model. In our case, if we keep ORMF with Requirement and RequirementNarrative as core elements, one could extend, or better instantiate the model using these classes and tagging or stereotyping them to represent UseCase or UserStory, or in the case of requirements, to create PrimitiveRequirement, PerformanceRequirement and the corresponding children (potentially as new classes) RequiredCapability and RequiredConstraint. Those elements could have relationships (since all artefacts can have them), which we'll stereotype PerformanceDemanding and DesignConstraining and we would end up with part of the Hatley/Hruschka/Pirbhai requirements model (see "Process for System Architecture and Requirements Engineering, Dorset-House, 2000, page 28 and following). The above diagram shows part of a potential profile. Whether we realize the classes in the diagram as true subtypes, by pure stereotyping, or by tagging only, is something that needs to be deliberated more deeply (maybe we leave it open in ORMF and allow users to do all?). The main point is, by having the building blocks available (packages, requirements, relationships, etc.) in the ORMF model, we enable people to build concrete models from them, which are then the basis for their tools and applications. In other words, we provide a framework for requirement modeling - which is what I understood is the true purpose of ORMF. If, for some good reason, you might want to keep more specific elements, such as UseCase, since they are so frequently used, I will not stand in the way. My only concern is, that we must maintain the ability to express more than one concrete model in ORMF. This is also the reason why I mentioned those other models at all. 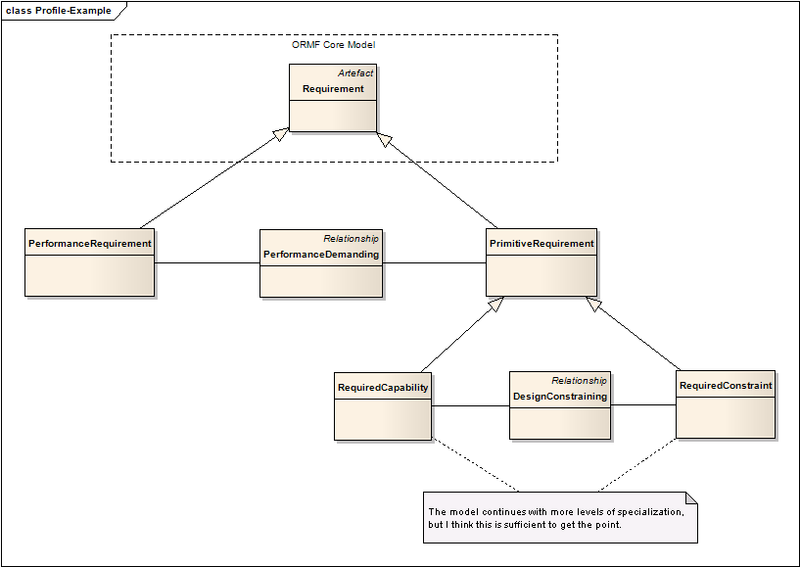 When I first had a look at ORMF I tried to represent my own requirements model using ORMF and failed. But maybe it was only my crazy view of the world that caused the failure, so I consulted my little library at home and found a couple of other models and tried those. When I failed with all of them, I started to abstract away from the details and searched for the commonalities among these models, which is how I arrived at the diagram above. I am sure, it is not even near to be complete, but if it only communicates my intention properly my time spent with it was not a total loss. Just a quick add-on: You can fully express the original ORMF model using the building blocks of my concept (as you can express at least four other models I know) and maybe, if we want users to have a quick start, we can provide some of those models already with ORMF as sample profiles or instantiations of the framework. In fact, I would encourage all readers of this conversation to try to express their own models and views of requirements using the building blocks of both models and give us their feedback - the more we get, the better for ORMF. I will, of course, not hide the price we will have to pay for being abstract: loss of details and especially loss of visibility of those unless the framework provides corresponding elements or handles to access them. This might lead to some "metadata-hell" as some of us might have experienced with (for instance) some xml-related technologies (remember DOM? ), where you have to query some element for the name of some other tagged value to obtain the actual element from which to get the proper tag to identify the tagged value you are actually interested in... I guess you get the point. Well, you can take any technology or concept over its limits, but if we handle this carefully, I see a strong potential for ORMF to live up to its expectations. Looking forward to any constructive comments! At first blush, I very much like the direction that you suggesting. I want to take more time to work through the implications, the advantages and disadvantages, but I have the sense we are making progress on our goal of creating a model that will support an open framework. You have mentioned a few other models that B. and I felt represented processes. You indicated that we were missing the point. I would very much appriate if you post pointers to where we can enlighten ourselves. The pointer to Hatley/Hruschka/Pirbhai book is good, but it requires going out and purchasing it. Any online references you have for this and the other models would be warmly welcomed. Thanks Wolfgang, I very much want to join Joel in his overall comment. I must admit that, while formulating our original model, we found ourselves struggling with the genericity and generality aspects, which your approach appears to promise. I just want to add a small note: I really liked your suggestion "I would encourage all readers of this conversation to try to express their own models and views of requirements using the building blocks of both models and give us their feedback - the more we get, the better for ORMF.". On that basis, I think we may want to consider, once we have agreed on the way forward, to, in a sense, merge our standards survey with this effort by simply boning up the model a little, providing a couple of profile examples similar to the one you have already offered and ask the experts of any given standard out there if the model can successfully represent those standards. I think this would make the survey easier to approach on the experts part, as they would not need to fill in a lot of textual information, and ultimately more productive. If I find the time, I'll put up an extract of the Volere Requirements Knowledge model up here this evening (it is already late here in central Europe). 1.) I don’t think that the distinction between the different types of requirements should be made by specialization from Requirement. Instead I propose an Attribute that identifies the kind of the Requirement. First this is more flexible e.g. allowing different sets of kinds by exchanging the enumeration and second I think that distinguishing between Requirement Kinds adds lot of semantics to the Framework. Basically every Requirement must be fulfilled in the end. 2.) I inserted the element “Stakeholder”. I think if responsibilities are in the scope of ORMF stakeholders should be addressed explicitly. Besides that, stakeholders are in every requirements definition I know, so I think they are basic enough to be addressed. 3.) I shifted the discriminator to DescribableElement (abstract) since I think not only the Documents but the RequirementAretfacts should have a Discriminator (maybe DescribableElement is no a good name for the abstract Type basically this element exists to reflect that the subtypes may have a Discriminator, a controlling Stakeholder –to reflect responsibilities, and a Status. 4.) The status reflects if the DescribableElement is accepted or if it needs more investigation. I didn’t dig too much into this, but I think this should be covered too. I think it’s also possible to model this as a part of a discriminator, but to me the status seems important enough to be modelled explicitly. There are possibly a lot of status I just added 2 to show what I intend for this item. 5.) I added the Relationship as a DescribableElement too. For relationship a distinction between different basic types should be made. I don’t know if here Subclassing or the use of an Attribute is better. Some different Relationships I can think of are e.g. : Conflict, Parent-Child, Implied-by or Depends-on. 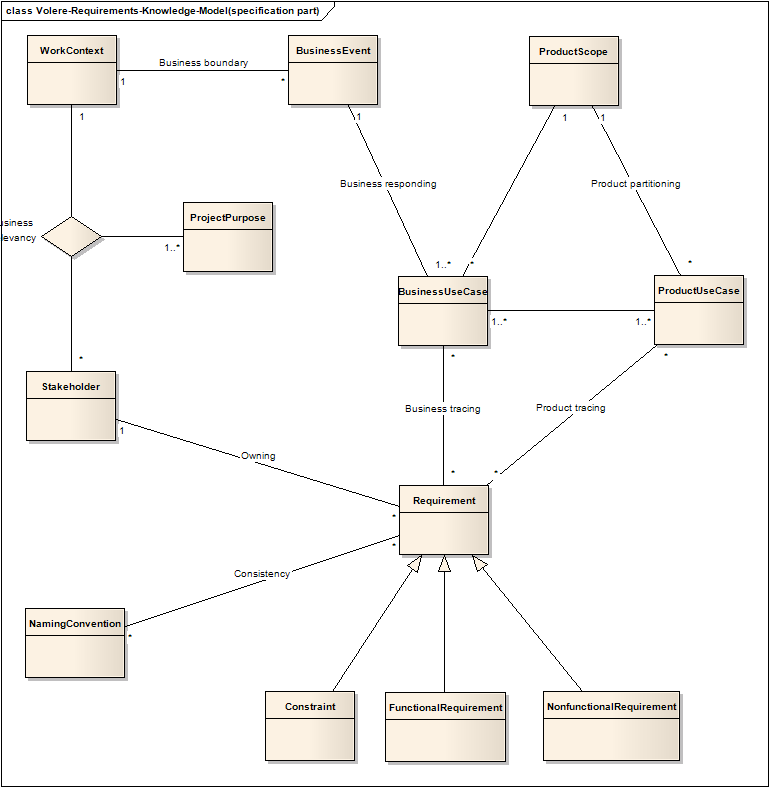 I don’t know if we should model for example the UML-UseCase relationships directly. Maybe they are not basic enough. 1) Indeed, attributes are a viable alternative as has been discussed among the ORMF committers already (you were probably not aware of this discussion). A final decision has not been made yet upon the way to go forward. Take the above model as a stimulus, not the final thing. Personally, I prefer attributes over inheritance for several reasons including the ones you mention, but it is not me alone who decides. Why have requirements types at all? Well, I agree, one could define them on demand, but my intention was to keep the original model as much as possible to highlight the points I wanted to address. Again, you are welcome in our discussions. 2) I included "Owner" for exactly this purpose. Maybe "Stakeholder" is the better term? 3) I assume there is a slight misunderstanding of the model. Any Taggable element (therefore any Relationship and any Artefact) can be part of a Collection. This is to reflect a very common scenario where a user groups arbitrary elements for some particular purpose (a release document, a report, a change request, or simply a working set or the user's favourite requirements - I think you'll get the point). A Document is only one of the many potential "users" of such a Collection. The purpose of the Discriminator element is, to allow the defining element of a collection to be manipulated, stored, retrieved, inspected, etc. - think of a Discriminator as some form of filter that can be applied to any collection of elements to obtain a specific collection (or filtered subset). Having the filter as an explicit element allows it to be applied in multiple scenarios, like filtering different sets of elements for the same date of last change, the same author (stakeholder), or the like. 4) Interesting point. I have considered the status of some Artefact to be of a more intrinsic nature, probably being modeled as simple attribute (Tag). Thinking about this a second time, however, I think I can understand your point. Maybe we should take this on board and extend it to represent the collection of potential states (we are doing a metamodel here) in, say, a "Lifecycle" element? This would also require to model the collection of States an Artefact can go through, and so on and so forth. Hmm, this may lead to a lot of complexity for something that could be expressed by a simple attribute. I think, the question is, how this would be used in practice. I have seen projects failing with carefully defined lifecycles for artefacts and others being successful with a simple lifecycle expressed by a simple attribute on each artefact and vice versa. On the academic side, of course, a Lifecycle element would have its charm. I am a bit undecided here. Maybe we'll get more comments on this from other people? 5) As I explained above, Relationships can be part of Collections just as Artefacts can. I guess, this covers your point. Whether we should Relationships also allow to have a Lifecycle - I don't know. It seems nice, but it will definitely make the model more complex (as any additional element would), so I am a bit reluctant. Bottom line, I think we have to balance being specific enough to make the framework attractive and being generic enough not to constrain the user too much. Everything we specify has its two sides. The more specific we get, the easier and quicker users will be able to apply the framework, but at the same time the more we constrain the user in the way they can apply the framework, which might prevent the framework from being used at all under certain circumstances. This is a comment I received from Ali Nasir, a member of the LinkedIn RQNG group, who agreed to share it. After reviewing the model I would like a little elaboration regarding User Story class. In my opinion Use Case Class should have some other relationships with the zero or one to many attributes like pre-conditions, pos-conditions, triggers etc related with use case. A use case can have dependency on one or more other use case so a relationship can be shown at high level to depict this scenario if required. Thank you very much for taking the time to review the model. As for relationships between use cases, we have a generic relationship, called "requirement relationship", at the level of the generic Requirement Artefact class. This relationship is meant to include, among others, all inter-use case associations of the types that you mention. Such associations will have all the concepts that you would expect in, say, an include relationship, such as multiplicity and stereotype. This is a comment I received from Ed Merks (yes, THE Ed Merks), who very kindly reviewed the model and agreed to share his suggestions. Your spelling of artifact is not the usual English spelling, so I corrected that. Your use of plurals also wasn't consistent, so I consistently gave multi-valued features plural names. I very much dislike abbreviations so I turned "req" into "requirement". Hi Ed. Happy new year to you! Thank you very much for your speedy review and for taking the time to actually change the model. I beg to differ on the artifact/artefact diatribe!... "Artefact" may not be the usual *American* spelling, but it definitely is the correct (and preferred) Queen English spelling. ;-) However, for the sake of conviviality, tolerance, cooperation and universal peace, I will be happy to stay with "artifact". Happy about removing abbreviations, I do not much care for them either. 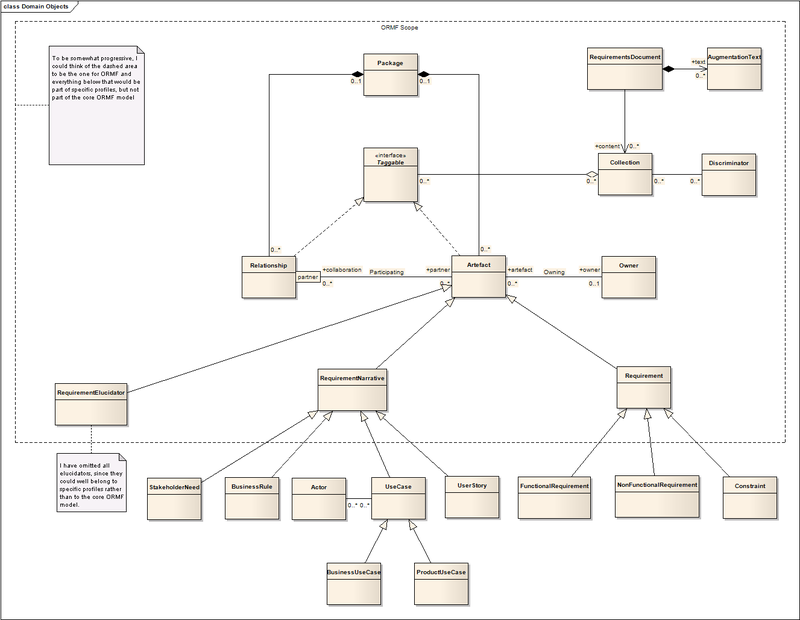 As for the lone Relationship class in the model, I was hopeful you would shed some light on a workaround to that one. In my descriptive text I mention that the Relationship class would ideally be an association class, attached to both the "requirements relationships" and the "elucidator relationships" associations. I know however that, for well documented reasons, EMF does not support association classes, so I wonder how you would suggest solving that quandary. Something like an association class would be very useful as it would embody attributes that go beyond a simple association. As you suspect, all of the classes in the model are going to be fleshed out considerably. We have decided to put the model out for comments and review at an early (very high level) stage in order to encourage improvements and corrections early on (in keeping with the old "the earlier the less expensive etc." adage). Finally, thanks for the observation about containment; I agree I need to revisit the containment aspects of the model and your suggestion of using the generated editor as an aid may be a really good one. First of all, I'd like to thank everybody for the comments, ideas and contributions. I think that very many good points have been brought to light and that the new requirmements model that will soon emerge will be much more solid and resilient than the original one. Before we move forward with distilling all discussions into a new "starting" model, I would like to ensure that we are all on the same wavelength as far as the ultimate scope of ORMF and the role the framework intends to fulfil. I think this is extremely important in defining the shape that the requirements model will take. ORMF is not intended as a framework for modelling requirements. Its main goal is to be able to capture information, produce reports and generate documentation that support the analyst in building the requirements set for the software project at hand. In the vast majority of the real world projects where we believe ORMF will play a part, the requirements practitioner does not really care about the nature of the requirements model in and by itself. All she wants is a set of tools that automate her daily capture/publication/reporting/management tasks, ultimately enabling her to deliver a product that fulfills the stakeholders needs. I would wager that, in most cases, the analyst does not even want to know if there is a requirements meta model behind the scenes. Of course the documentation that is desired, as well as the types of reports that would add value, may well have to adhere to company and/or global standards and best practices, as well as be able to follow company processes; these aspects must definitely be taken into consideration when designing ORMF. Whether or not ORMF is capable of expressing HHP or Volere or any other existing or yet to be conceived requirements model is not what we should be primarily worried about. Note, however, that after considering both of these I see that there is much we can learn from them to strengthen ORMF. What I am trying to get at here is a concern I have that, in our enthusiasm, we are loosing sight of our stated goals. Believe me, I am always the one that needs to be restrained from wandering off into the land of academic exercises. As painstaking as it is to say it :-), I think we need to make sure that we place the model in the right perspective. At the cost of sounding like a ponderous bore, let me say it again: the requirements meta model is not the end of our effort, but simply a means to ensure that the average software project is assisted in the production and communication of its requirements. Is everybody agreed on this fundamental point? Thank you for your comment, which highlights what we should not forget. I must admit, however, that although I agree with the objective, I do not agree with your conclusion. The metamodel clearly is not the end, but a means to an end. But for the framework it is more than that, it is the foundation upon ORMF is built, not more, but not less either. Get it wrong and ORMF will fail. Get it too generic and it will be of little use to many people. Get it too specific and it will be too constraining for many others. I think, we still need to find the proper balance. And I also think that there is value in building this model. In the end, it becomes the vocabulary by which an ORMF user can define what to be captured, the elements to be included in reports, or the kinds of relationships to be traversed looking for changes. On the other hand I understand your concerns about getting too "academic". There is no use in a beautifully elaborated model if it misses the point. Your statement about the "daily capture/publication/reporting/management tasks" might lead the way out of this situation. You reminded us of the main activities ORMF needs to support - let's elaborate on those to find out what ORMF needs to provide for each of them and rethink our model based on our findings there. - "for the framework it is more than that, it is the foundation upon ORMF is built"
- "it becomes the vocabulary by which an ORMF user can define what to be captured ..."
Possibly (hopefully;-) this is mostly about expressing ourselves clearly enough that we all see through the confusion. I apologise if I gave the impression that I underestimate the importance of the meta model or, worse, that I think we can do without it. We all agree that it is fundamental and that it is important to get it right at this stage. There are a few concepts, which are based upon the discussions and models proposed so far, that need, I think, further elucidation and that I would like for us to debate. My intention is to clarify these concepts in order to then move forward with a new version of the model. I am going to start a new Wiki page for the purpose. Please stay tuned. This page was last modified 10:36, 15 February 2009 by Barbara Rosi-Schwartz. Based on work by Joel Rosi-Schwartz, Wolfgang Ponikwar and Veit Hoffmann and others.